Google self-driving car: It may never actually happen. The autonomous Google car may never actually happen. 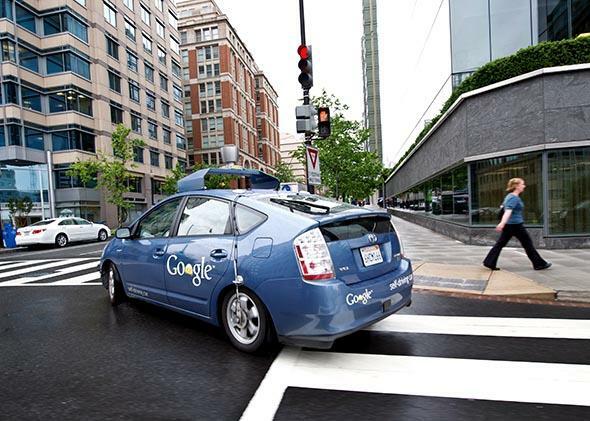 A Google self-driving car maneuvers through the streets of Washington in 2012. A good technology demonstration so wows you with what the product can do that you might forget to ask about what it can’t. Case in point: Google’s self-driving car. There is a surprisingly long list of the things the car can’t do, like avoid potholes or operate in heavy rain or snow. Yet a consensus has emerged among many technologists, policymakers, and journalists that Google has essentially solved—or is on the verge of solving—all of the major issues involved with robotic driving. The Economist believes that “the technology seems likely to be ready before all the questions of regulation and liability have been sorted out.” The New York Times declared that “autonomous vehicles like the one Google is building will be able to pack roads more efficiently”—up to eight times so. Google co-founder Sergey Brin forecast in 2012 that self-driving cars would be ready in five years, and in May, said he still hoped that his original prediction would come true. By most accounts, a demo ride in any of the Google cars is an astonishing thrill. It’s even more impressive when you recall that in a much-publicized test only a decade ago, robotic vehicles couldn’t finish even eight miles of a 150-mile course. Surely it’s still possible, despite the current challenges, that Google’s legion of genius Ph.D.s could make quick work of any remaining obstacles. Right? Probably not. For starters, the Google car was able to do so much more than its predecessors in large part because the company had the resources to do something no other robotic car research project ever could: develop an ingenious but extremely expensive mapping system. These maps contain the exact three-dimensional location of streetlights, stop signs, crosswalks, lane markings, and every other crucial aspect of a roadway. To create them, a dedicated vehicle outfitted with a bank of sensors first makes repeated passes scanning the roadway to be mapped. The data is then downloaded, with every square foot of the landscape pored over by both humans and computers to make sure that all-important real-world objects have been captured. This complete map gets loaded into the car’s memory before a journey, and because it knows from the map about the location of many stationary objects, its computer—essentially a generic PC running Ubuntu Linux—can devote more of its energies to tracking moving objects, like other cars. But the maps have problems, starting with the fact that the car can’t travel a single inch without one. Since maps are one of the engineering foundations of the Google car, before the company’s vision for ubiquitous self-driving cars can be realized, all 4 million miles of U.S. public roads will be need to be mapped, plus driveways, off-road trails, and everywhere else you’d ever want to take the car. So far, only a few thousand miles of road have gotten the treatment, most of them around the company’s headquarters in Mountain View, California. The company frequently says that its car has driven more than 700,000 miles safely, but those are the same few thousand mapped miles, driven over and over again. Another problem with maps is that once you make them, you have to keep them up to date, a challenge Google says it hasn’t yet started working on. Considering all the traffic signals, stop signs, lane markings, and crosswalks that get added or removed every day throughout the country, keeping a gigantic database of maps current is vastly difficult. Safety is at stake here; Chris Urmson, director of the Google car team, told me that if the car came across a traffic signal not on its map, it could potentially run a red light, simply because it wouldn’t know to look for the signal. Urmson added, however, that an unmapped traffic signal would be “very unlikely,” because during the “time and construction” needed to build a traffic signal, there would be adequate opportunity to add it to the map. Noting that the Google car might not be able to handle an unmapped traffic light might sound like a cynical game of “gotcha.” But MIT roboticist John Leonard says it goes to the heart of why the Google car project is so daunting. “While the probability of a single driver encountering a newly installed traffic light is very low, the probability of at least one driver encountering one on a given day is very high,” Leonard says. The list of these “rare” events is practically endless, said Leonard, who does not expect a full self-driving car in his lifetime (he’s 49). Every unfinished piece of technology—every prototype, which is what the Google car is—has plenty of items to check off on its to-do list. But the biggest issue with the Google car is one that has bedeviled computer researchers for as long as computers have been around: how to endow the machines with the sort of everyday knowledge that humans acquire and use from childhood on. Because Google is promising the world a totally driverless car, it will need an in-vehicle computer that can deal not only with all the obvious tasks of driving but anything else the world throws at it, whether on a congested city street or a highway with an 85 mph speed limit. Clearly, “autonomous driving” will increasingly be built into automobiles. One example is the “adaptive cruise control” offered now by many carmakers, which allows a vehicle to keep up with the flow of traffic. But it will be a far cry from having a Google-style computerized chauffeur. We tend to lionize computer researchers, forgetting that they’ve made some colossally bad predictions over the years. When 2001: A Space Odyssey premiered in 1968, MIT’s Marvin Minsky assured the public that machines like HAL would indeed be possible in 30 years. Perhaps one day tech enthusiasts will be able to visit a Museum of the Future That Never Was, where the Jetsons’ hover car and the Google super-robocar will sit side-by-side as showcase exhibits. Expect long lines for both, because the demos will be sensational.